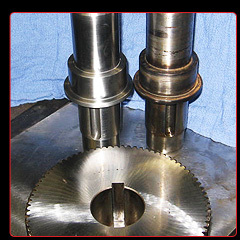 CMS Airends include the installation of new bearing gaskets, seals, remetalizing and grinding of shafts and rotors, repair to the front and rear housings when necessary, and repair of the sealing strips and oil pump. On Ingersoll Rand, Sullair, Gardener Denver, and Compair encapsulated airends, we will provide new filters and separators. 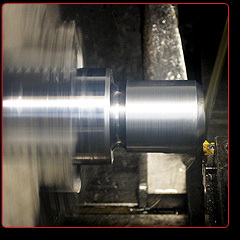 On direct drive units, we service the motor, clean winding, bakeout, and install new bearings and seals. Normal turnaround on our rebuilds is 3 - 5 working days for an average airend. To see more of our finished work, please visit our gallery. CMS rebuilds adhere to strict tolerances, use the highest standards to ensure quality, and are backed by a CMS warranty on equipment repaired and defects in materials replaced as well as workmanship for a period of twelve ( 12 ) months. Your airend is off loaded and taken immediately to the disassembly area which contains mountingstand,overhead crane and oil pit for collecting waste oil. All shipping documents are then forward to the office to be assigned a work order number, and a folder is generated for disassembly, teardown and spec sheets. This folder follows the airend through the entire rebuilding process to ensure accurate documentation. Once we receive the OK and Purchase Order number from the customer, all parts that require work are brought to different areas of the shop and the repairs begin. The front and rear covers will be metalized using the thermal ARC system, when finished depending on the size of the cover, its moved to either the 20” or 36” Blanchard grinder for finishing. CMS warrants all airend rebuilding for a period of twelve ( 12 ) months against defects in materials replaced and workmanship performed. We are pleased to service the following manufacturers. IMPORTANT: Coupling alignment and placement is critical to airend performance and longer life. Install the new coupling per the manufacturer's installation instructions. There should be a gap on insert type couplings and bolt-on couplings. Make sure that you are not forcing the coupling cushion in place. This will add additional load on the pilot and motor bearings which will cause premature failure. The coupling should be aligned to within .005 both ways.